Distressed Denim Scale: Are You a Miranda Kerr or Gigi Hadid? The more wear, the better. In the ‘70s and ‘80s, punk enthusiasts wore ripped jeans with accoutrements, like safety pins and buttons, in an act of defiance against mainstream fashion. These days, distressed denim is being taken to a whole new deconstructed level. And Hollywood's most fashionable ladies are leading the charge. Everyone from Rihanna to Gigi Hadid is sporting the trend, wearing it in a variety of ways, from small ripped sections above the knee to fully exposed, gaping holes. Some may say that the distressed denim trend is getting out of hand, with some extreme iterations being almost unwearable. Others call it fashion. 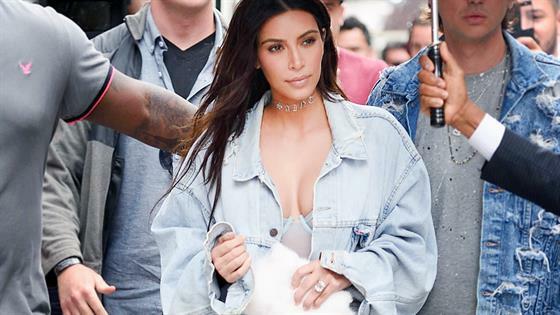 Whether you're just dipping your toe in the trend or you're ready to push the boundaries, there's a distressed denim spectrum—and celebrities are our identifying markers. What stage is your style at and how far are you willing to go? Keep scrolling to see where you range. A stage one denim distresser is just dipping their toes in the trend. Sometimes, a speck of wear and red-hot, ankle-wrap heels are just enough to elevate a pair of blue jeans. It's natural for fabric to stretch and unravel by itself. Eventually, Miranda's threaded speck can widen out to Joan's above-the-knee hole. Skinned knees are real. Think of two distressed holes in the middle of the pant legs as fashionable knee pads. Stage three denim distressers are fashion stunt people. Sliding or extreme physical activity in these jeans, however, is not recommended. There's no limit on how many holes and gaps you can have. While at or just above the knee seems to be the traditional spot, stars like Hailey are proving exposed threads can be placed anywhere. If you're in the middle of the distressed denim spectrum, those jean threads have stretched to the limit and there's now sections of exposed skin between really stretched strings of fabric. Do as the Quantico star and let skin breathe. The model proves you can really play with hole sizes. Her gaps are wide but vertically short. The top right hole is more like a sliver, making it a unique design detail. Here's the point that separates the risk-takers from the rest of the fashion pack: when distressed threads turn into holes and then gaping holes. The hole is so big that the unsupported fabric ever-so-subtly hangs from the rest of the pant. At this point, most would throw away their jeans, but the model embraces the negative space, however big or small. Pairing exposed skin with an oversize piece helps to balance out the look. Distress your jeans anymore, and you might as well wear shorts. Gigi is the champion of this look, taking the trend to the max. If you're a stage 10 denim distresser like the model, you aren't scared to wear jean scraps. There might be fabric barely hanging on your legs, but you know how to layer it on top like the model. Want to push the boundaries even further? It's all about confidence.